1. Flight test of the Lockheed YP-38 airplane equipped with Allison V-1710-27 and 29 engines and constant speed propellers, blade design No. 615CC1.5-6. 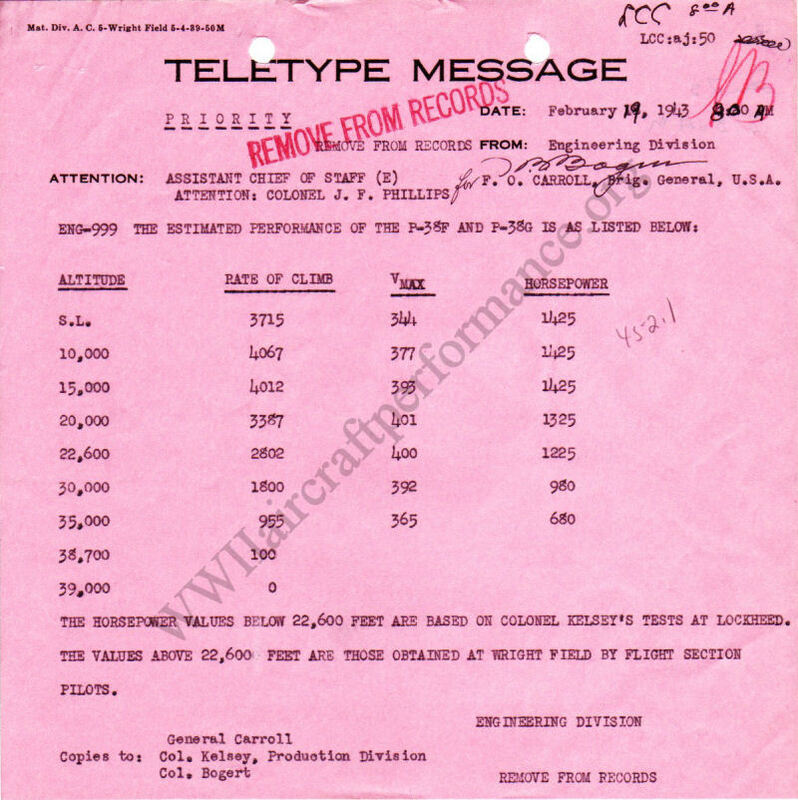 Airplane flown at full military load of 13,500 lbs., c.g. at 29.44% m.a.c. Radio antenna in place, gun openings covered, wheels up, wing flaps neutral. Note: All level flight runs made with prestone and oil cooler shutters in the flush position. Airplane will not meet Air Corps cooling requirements with shutters in this position. Altitude obtained in 6 mins is 18,100 ft. using military power for 5 mins. 1. 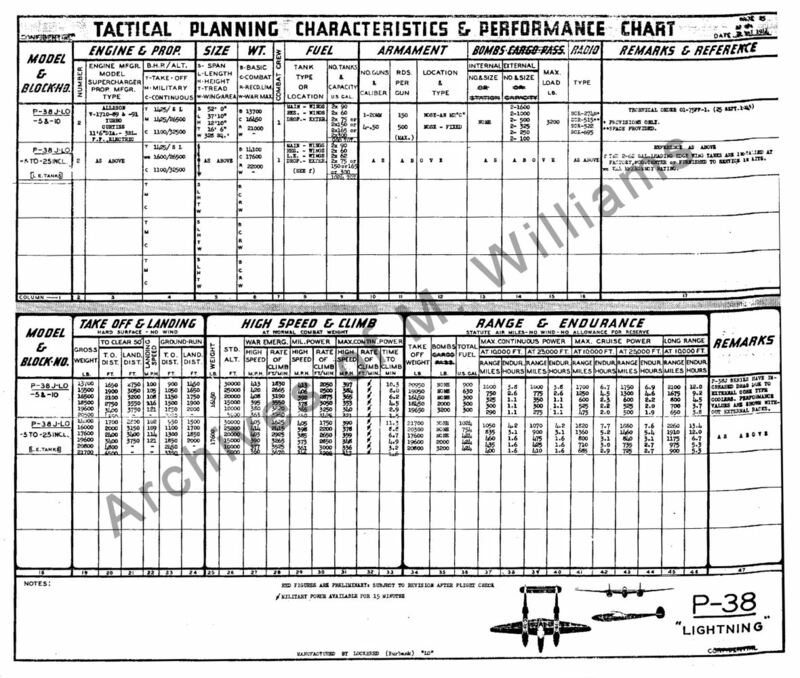 To report on performance tests of P-38D airplane, A.C. No. 40-774. Airplane equipped with Allison V-1710-27 and V-1710-29 engines and three-bladed constant speed propellers, blade design No. 615CC1.5-6 and 614CC1.5-6, normal blade angle range 21.5° to 56.5° at 42" radius. Airplane not weighed at Wright Field but loaded with 2485 lbs. useful load. Landing gear retracted; wing flaps neutral. Cockpit cabin closed; prestone and oil cooler shutters in faired position, radio antenna in place, guns installed and not covered. Engine equipped with individual port backfire screens. B. Test Results: Based on horse power figures furnished by Power Plant Laboratory. Data obtained from dynamometer tests of V-1710-27 engine, A.C. No. 40-3012. However, horse power data still appears doubtful in the light of results obtained in flight tests (i.e. Note: that 300 h.p. are required to change from 319.5 mph at 2600 at 2000 bhp to 322 mph at 3000 rpm at 2300 bhp at 5000 ft.). 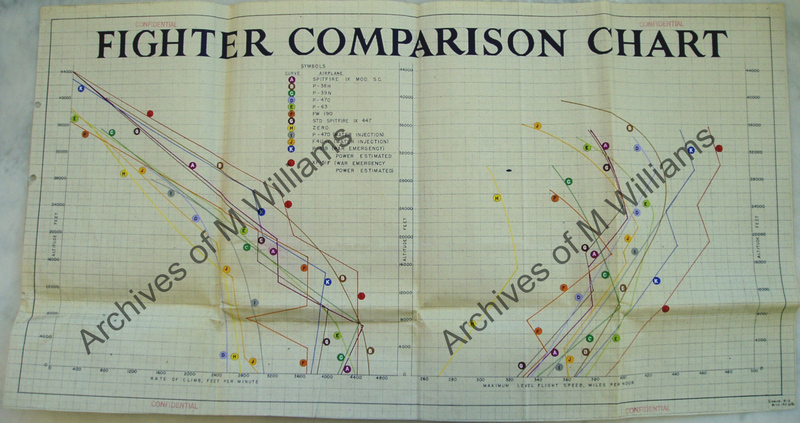 Practically all flight tests on airplanes equipped with torque meters show that the power chart method for determination of B.H.P. is not reliable. *Carburetor air intercooling is insufficient to meet Air Corps requirements but is better than on the P-38E. 1. 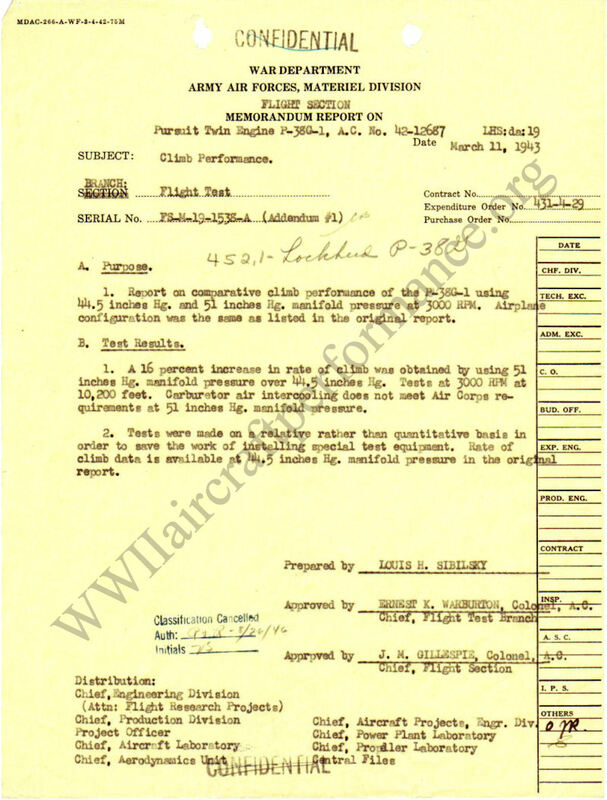 Report on flight tests of P-38E conducted at the manufacturer's plant. Airplane equipped with Allison V-1710-27 and V-1710-29 engines and three-bladed constant speed propellers, blade design No. 615CC1.5-6 and 614CC1.5-6, normal blade angle range 21.5° to 56.5° at 42" radius. Gross weight as tested 14,458 lbs., c.g. 30.85% m.a.c. with wheels up. Landing gear retracted; wing flaps neutral; cockpit cabin and ventilator closed; prestone and oil cooler shutters in faired position in level flight, wide open in climb; radio antenna in place; flush cover plates over gun openings. 2. Level flights at 20,000 ft. density altitude, corresponding pressure altitude 18,400 ft., free air temperature -7° C., mixture automatic rich for military and normal rated r.p.m. tests, in automatic lean position for cruising r.p.m. flights. The test had to be discontinued after 4 mins. when the left engine cut out. Inspection of the Cuno strainer showed metal particles. A report has not yet been received as to the nature of the failure. Test discontinued at 26,000 ft. due to high carburetor air temperature. 1. Report on acceptance performance tests of P-38E conducted at the manufacturer's plant. Airplane equipped with Allison V-1710-27 and V-1710-29 engines and three-bladed constant speed propellers, blade design No. 615CC1.5-6 and 614CC1.5-6, normal blade angle range 21.5° to 56.5° at 42" radius. Gross weight as tested 14,458 lbs., c.g. 30.85% m.a.c. with wheels up; landing gear retracted; wing flaps neutral; cockpit cabin and ventilator closed; prestone and oil cooler shutters in faired position in level flight, wide open in climb; radio antenna in place; flush cover plates over gun openings. B. Test Results: Based on horse power figures furnished by Power Plant Laboratory. 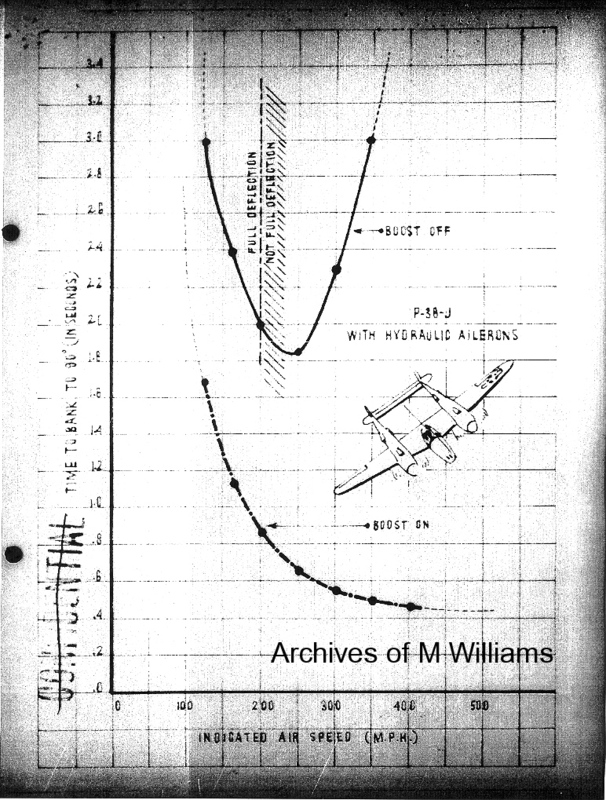 Data obtained from dynamometer tests of V-1710-27 engine, A.C. No. 40-3012. 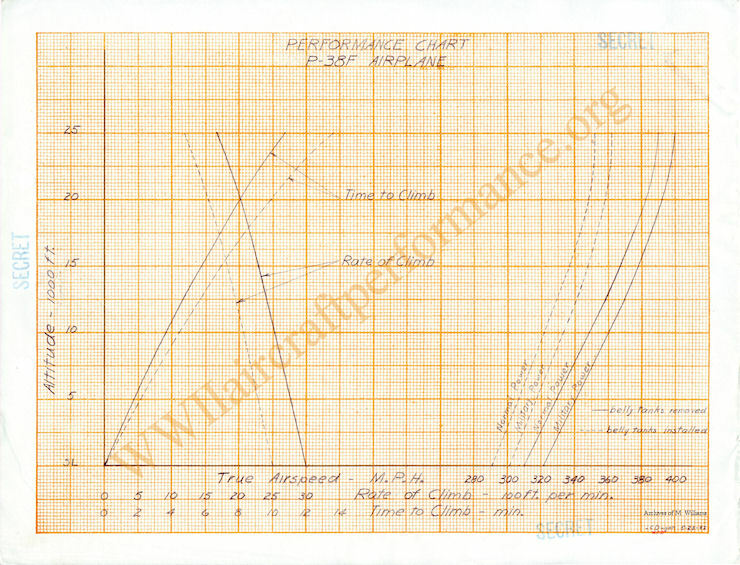 *Carburetor air intercooling is insufficient to meet Air Corps cooling requirements. Endurance at Normal Power (1000 BHP per engine) at 20,000 Ft. 1.1 Hr. ** Time to climb to 20,000 Ft. 7.6 Min. Distance required to take-off or land over a 50 ft. obstacle, within 2100 FT. The performances stated in this paragraph are guaranteed to +/- 1.5%. Engine power ratings for both the V-1710-F5 and the V-1710-F10 engine installations shall be the same. * Based upon sea level compressibility correction. ** 5 minutes at 1150 BHP per engine, 2.9 minutes at 1000 BHP per engine. i. The guns will not feed properly during maneuvers which create a pull of greater than 3-1/2 G�s. 1. 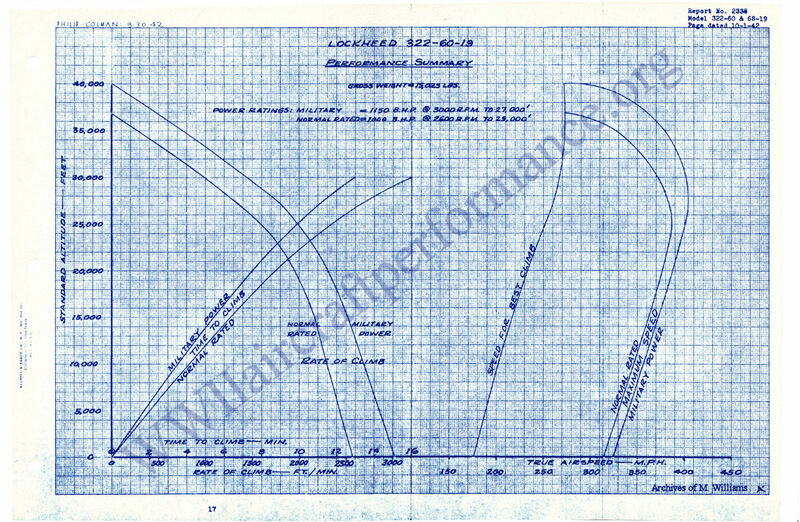 Report on performance of P-38G-1 equipped with V-1710-51 and -55 engines and three bladed constant speed propellers, design Nos. 88996-18 and 89303-18, blade angle range 22.7� to 57.7� at 42 inch radius. Take-off gross weight 13,900 pounds, c.g. location wheels up, 30.9 percent m.a.c. Tested with one 20 mm. cannon (50 rounds of ammunition) and two .50 caliber guns (400 rounds), radio antenna (three wire) in place, and with 180 gallons of fuel. Wheels up, wing flaps neutral, prestone and oil cooler shutters in the faired position for level flight and wide open in climb. Mixture control auto-rich for high speeds and climb. 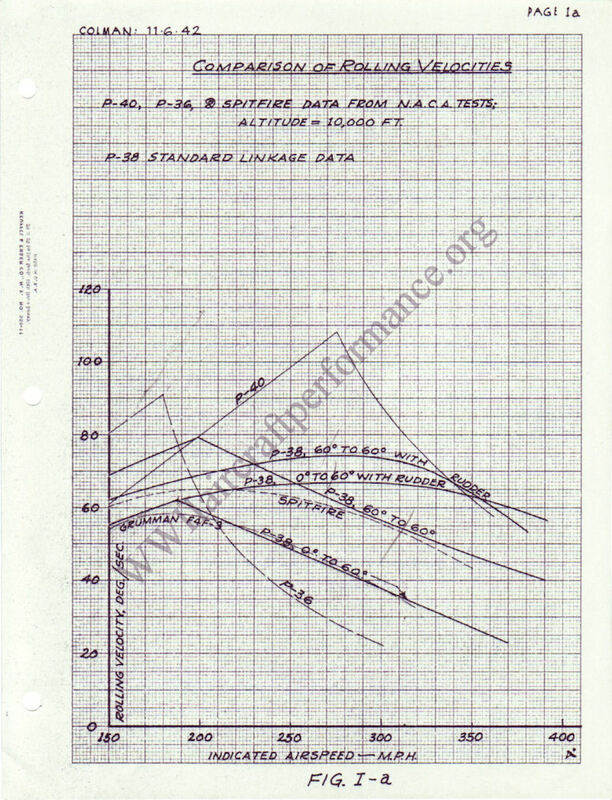 Brake horsepower figures in this report were obtained from power curves. 1. Level flight speeds at 3000 RPM. **Critical altitude of turbo installation for 44.7 inches HG manifold pressure. Carburetor air temperature is the limititing factor. 20,000 219 1195 3280 5.68 44.7 Carb. Temp. 25,000 230 1090 2680 7.36 40.6 Carb. Temp. a. All conclusions and recommendations applying to the P-38F, apply to the P-38G. b. Inasmuch as the general maneuverability of this aircraft is probably the lowest of any type of current fighter aircraft, and in view of the competition facing the P-38G in the European Theatre, all possible effort should be made to improve its rate of climb and high speed. c. The P-38G turns much better than the P-38F (will close 180° in 360° circle) due to maneuver flaps. d. Buffeting was noticeable but at higher speeds and accelerations than in the P-38F. e. The P-38G will outzoom the P-38F. f. The P-38G will hold its altitude in turns at thirty-five-thousand (35,000) feet, whereas the P-38F loses altitude. g. The P-38G holds its advantages over the P-38F at all altitudes. h. The lack of sufficient intercooling holds down the performance of the P-38G as well as the P-38F. Level flight results of the P-38J, AAF No. 43-13563 were obtained with wheels up, wing flaps neutral, intercooler flaps flush, coolant flaps automatic and carburetor auto-rich. Results of flight test on two P-38J airplanes at Wright Field indicated that these airplanes are unsatisfactory for tactial use above 20,000 ft. Considerable induction system leakage was encountered in both airplanes resulting in a loss of critical altitude of approximately 7500 ft. Additional trouble was encountered while testing the first of these airplanes at war emergency power in that one engine had to be changed and several revisions were required in the exhaust system before tests could be continued. It is believed that the P-38J airplanes at Wright Field are representative production airplanes and it is recommended that immediate action be taken to correct the leakage in the induction system, either through redesign or better production control of the manifold leading from the turbo to the engine. The P-38J is designed as a high altitude fighter interceptor. This airplane has a fast rate of climb and performs well at high altitude, however, caution must be used in acrobatics and diving maneuvers at all altitudes to keep below limiting airspeeds. These airspeed limitations are low due to tail buffeting which may eventually cause structural failure and are definitely objectionable and hazardous from a combat viewpoint. The stability about all axis is good, the radius of turn is fairly large for a fighter and the rate of roll is fair at medium speeds, but slow at high speeds because of heavy aileron forces. The single engine operations, visibility on the ground and in the air and cockpit layout is good. High speed and climb performance have been completed on this airplane at a take-off weight of 16,597 lb. This loading corresponds to athe average P-38 combat weight with full oil, 300 gallons of fuel and specified armament and ammunition. (60.0" Hg. Man. Pr. & 3000 rpm) = 4000'/min. Rate of climb at critical altitude, 23,400 ft.
(60.0" Hg. Man. Pr. & 3000 rpm) = 2900'/min. Time to climb to critical altitude, 23,400 ft.
(60.0" Hg. Man. Pr. & 3000 rpm) = 6.49 min. The P-38J-15 is a twin-engine, high altitude interceptor-fighter. The airplane performs well at high altitude, having a good maneuverability and radius of turn when using maneuvering flaps. The rate of roll is fair at medium speeds and slow at high speeds because of high aileron forces. This is improved in later models by the use of aileron boost. The principal results are summarized in the following paragraphs. In level flight at 19800 ft., the critical altitude for 70" hg. 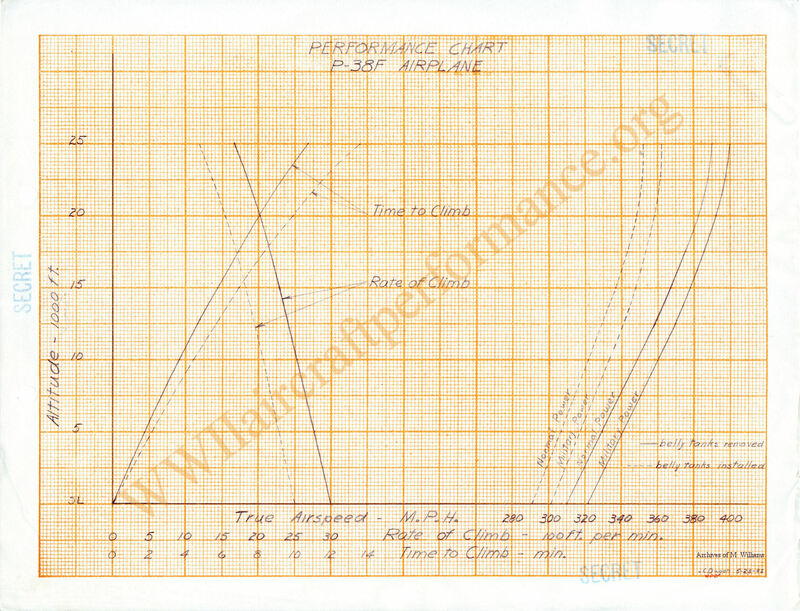 manifold pressure, 3000 RPM, and 26,300 limiting turbo RPM, a maximum speed of 419 MPH was attained. At this altitude a high speed of 402.5 MPH was attained at 60" Hg. manifold pressure. At 24000 ft., the critical altitude for 60" Hg. 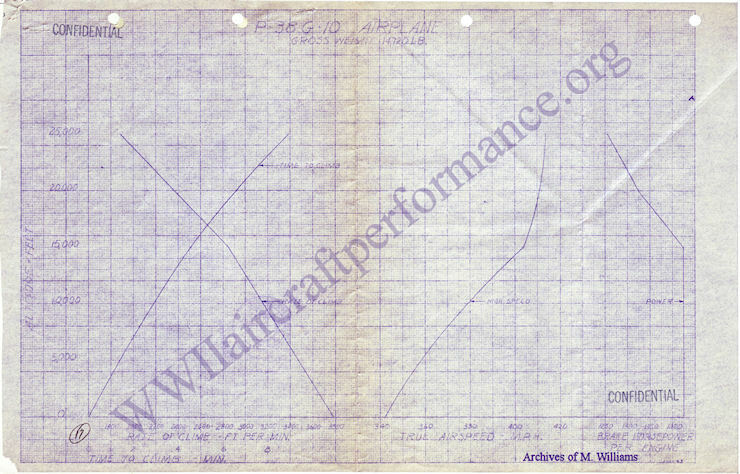 manifold pressure, 3000 RPM, and 26,300 limiting turbo RPM, a high speed of 413 MPH was attained. 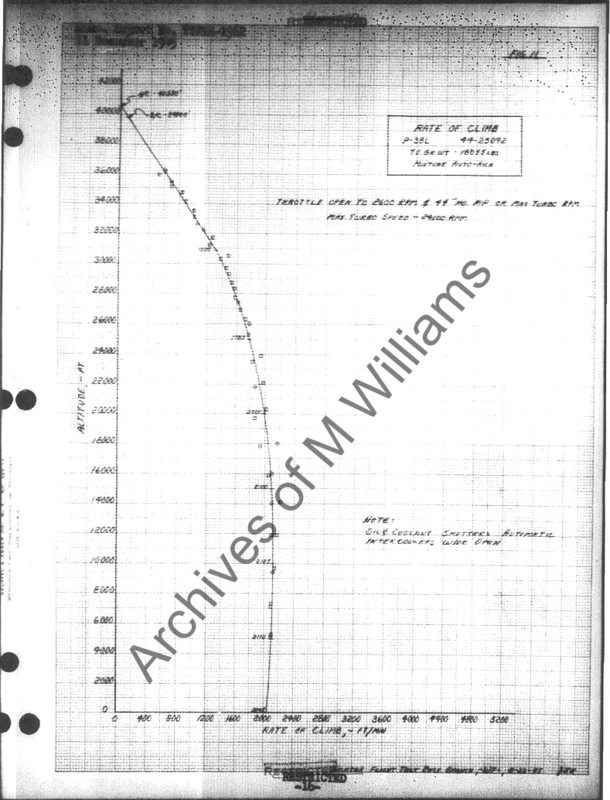 At sea level a maximum rate of climb of 4040 ft/min was attained at 70" Hg. manifold pressure and a rate of climb of 3570 ft/min at 60" Hg. manifold pressure and 3000 RPM. The service ceiling of the airplane was 39,000 ft., and the absolute ceiling was 39,700 ft. Flight tests were conducted on the P-38L airplane, AAF No. 44-25092, at Wright Field, Dayton Ohio and Miami Depot, Miami, Florida in order to obtain a performance and range check of the data given as tentative figures in Pilot's Flight Operating Instructions, AN 01-75-1. 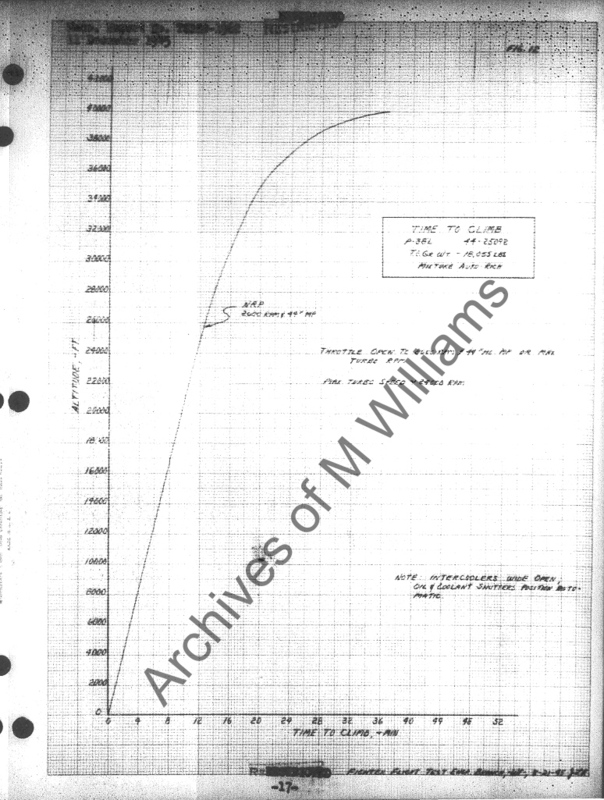 The following speed data was obtained with the airplane in the clean configuration. Data is corrected to weight at altitude as given in Figure 4, Appendix A and NACA standard day conditions. a. True speed at sea level at war emergency power, 1530 BHP and 3000 RPM, was 342 MPH. b. 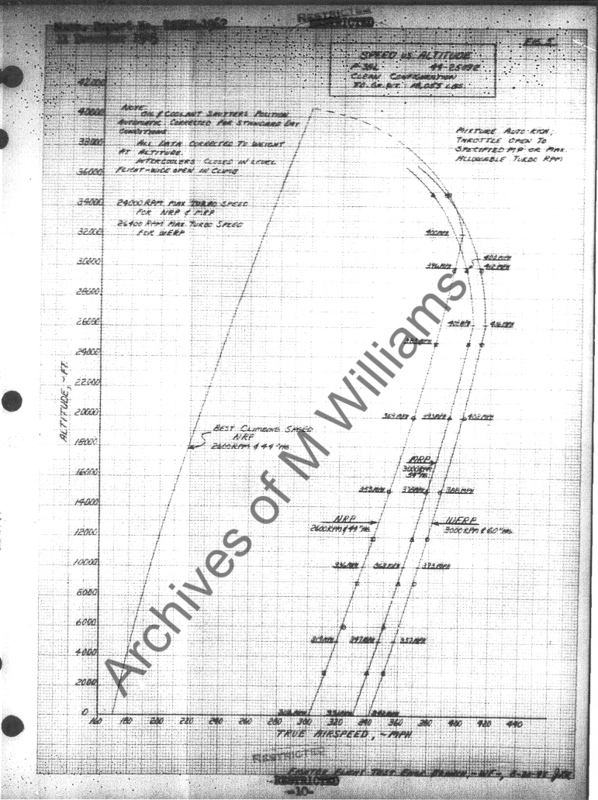 True speed at critical altitude, 26,000 feet, at war emergency power, 1495 BHP and 3000 RPM, was 416 MPH. c. True speed at sea level at military power, 1395 BHP and 3000 RPM, was 331 MPH. d. True speed at critical altitude, 26,200 feet, at military power, 1385 BHP and 3000 RPM, was 408 MPH. e. True speed at sea level at normal rated power, 1110 BHP and 2600 RPM, was 302 MPH. f. True speed at critical altitude, 32,200 feet, at normal rated power, 1138 BHP, was 400 MPH. Unfortunately, portions of the original report are missing. Allison V-1710-91 Engine Operated on Grade 104/150 Fuel.